Why I read this: I've had it on my shelf for more than a year and on my wishlist even longer than that. It was about time to finally pick it up. Plot: An adventurous story set in the Asia of old, this tale takes you on a journey that will astound you. I loved the visual imagery along with the unique characters and fantastical situations that occurred. 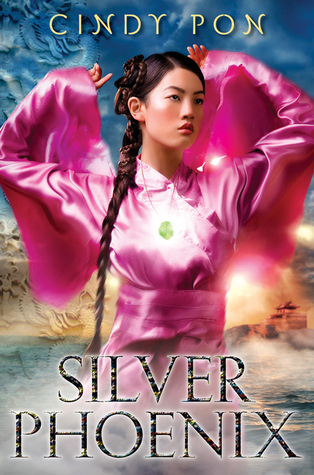 Gorgeously well-written with a cinematic feel, Silver Phoenix will take you to a world that is beyond beautiful and filled with creatures both glorious and dangerous. Characters: Ai Ling and Chen Yong were both such unique characters. They had such drive to continue on and complete their journeys. I really loved watching them fall in love slowly throughout the book. Relatability: I think anyone interested in Asian culture will enjoy this novel, especially if they also enjoy fantasy. I'm always interested to read fantasy novels set within Asian culture as it seems so rich and diverse. I've heard a lot about this one, not the least of which is a lot of controversy surrounding the choice of ethnicity on one of the covers. But what I've heard about the story itself is that it's actually pretty good, and it's one that's been on my wishlist for a while now. Hopefully I'll be able to pick up a copy for myself soon, so I can give it a try. Your review reminds me of Tiger's Curse by Colleen Houck. That was very visual and cultural (India), too. I really liked it a lot. I'll see if my lirbary has this. Thanks for the review! I really like your format. oooh awesome rating, I can just imagine loving this! I've never really read anything to do with Asian culture before. Silver Phoenix sounds like it might be a good place for me to start. I've been hearing good stuff about this and I really think I should pick it up once my TBR pile slims down a bit. It could be something that I could really enjoy!